Well, there is the great Marmite debate: love it or hate it? And then there is the even greater divide, chocolate with Marmite, yes or no? I happen to be a big Marmite fan, as long as it is applied sparingly, but combined with chocolate I’m not so sure. Or at least I was somewhat dubious until I was sent a bar of Very Peculiar to try. In case you are unfamiliar with this, it is Marmite chocolate. I like the combination of salt and sweet, but there is a lot more to Marmite than just salt. Read on. Very Peculiar is an apt name. The first bite tasted very peculiar indeed, the flavour of garlic and celery was there and took a bit of getting used to, but by my second bite I was getting something that was more akin to the taste of peanut butter. Now peanut butter and chocolate is one of the flavours I’m really rather fond of. By my third bite I was thoroughly enjoying it and had to put a stop to proceedings before I polished the bar off. Strangely the Marmite only came through as an aftertaste. The chocolate is minimal, only 31% and the list of ingredients is long, but I found this strangely addictive and would not be averse to another bar or two. CT rather enjoyed it too and for a while I was worried it would never actually made it to the bake I was planning. Along with the bar of Very Peculiar came a box of baking goodies which included, not surprisingly, a jar of Marmite. I was tasked with using the chocolate to create something delicious. I took the remaining half of the bar and put it somewhere safe while I contemplated its fate. Remembering the delicious sea salted caramels I’d recently reviewed, I thought Marmite caramel might just work. Chocolate brownies made with Very Peculiar and oozing soft caramel was the vision that set my pulse racing. So Marmite Caramel Brownies it was. The Marmite caramel was a triumph of perfectly balanced salt and decedent sweetness with a certain je ne sais quoi and it was all I could do not to tuck in straight away with a large spoon. Supertaster CT detected the Marmite, but my mother was none the wiser and just pronounced it to be delicious when I gave her a spoonful to try. The brownies were true to my vision and completely scrumptious. They had the classic crunchy top and were running with caramel. I had to try one warm from the oven and thought things really couldn’t get better than this. Despite the sweetness of the caramel, these were well balanced by both the Marmite and the dark chocolate. The Marmite gave a slight saltiness and a certain umami quality that we all liked, although CT was the only one who could actually taste Marmite. The next day, they had formed a more fudgy consistency, but were just as good. These have to be some of the best brownies I have ever made. If you like sweet and salt together and particularly sea salted caramel, you will like these brownies. Melt the honey and marmite in a pan over medium heat, then slowly add the sugar and leave for a few minutes to melt and lightly caramelise. Melt the butter and chocolate in a large pan over low heat.Remove from the heat, add the sugar and stir. Beat in the eggs one by one, then sift in the dry ingredients. Stir until just combined, then spoon half the mixture into a 20 cm square mould (line as appropriate). Spoon the cooled caramel over the top, then dollop over the rest of the brownie mixture. Drag a skewer through the mixture to swirl it together slightly. Bake at 180°C for 25 minutes until well risen with only a slight wobble to it. Leave to cool, then cut into 12 pieces. As these brownies are thoroughly wicked, I am sending them off to this month’s Calendar Cakes which is hosted by Dolly Bakes with the theme something wicked this way comes…. This monthly challenge is co-hosted at Laura Loves Cakes. Made from scratch as these are with perhaps the best caramel I’ve ever made, I am submitting these Marmite Caramel Brownies to Javelin Warrior’s Made With Love Mondays. Thanks to Beth from Splendid Communications for the bar of Very Peculiar and accompanying baking items which I was sent in order to create a Very Peculiar bake. Can’t WAIT to try this next time I’m in the UK! I’m such a fan of marmite and the sweet and salty combination! Thanks for posting! Wow – you are a brave and clever lady! I have tried Very Peculiar and like it although I couldn’t have identified the Marmite in it. Your brownies sound gorgeous. I’m a Marmite hater, and the only way you’ll convince me these brownies work, is to send me one! I’m not sure if I like marmite… I never liked it as a kid but I quite like the smell now. These brownies are persuading me to give it a try. They look and sound delicious! I love Marmite and these sound very interesting indeed. I will look out for a bar of Very Peculiar, it sounds intriguing. First of all, thanks for dropping by my blog! Secondly, WOW – these brownies sound delicious! I don’t care for Marmite – but this recipe is tempting me to give it another go! By the way, on the subject of chocolate, a work colleague and I recently went on this Chocolate Walking Tour of London. Have you been? It’s FANTASTIC! I was introduced to the chocolates of Paul A.Young and have realised just what magic can be woven into chocolate. I highly recommend this walk. Cheers! I have tried that marmite chocolate and was surprised by how much it worked. Love the look of your brownies. How intriguing! I tried the marmite chocolate and wasn’t a fan but these brownies have got me curious. I love marmite and have tried marmite chocolate previously which I didn’t like initially but it slowly grew on me. This brownie sounds heavenly to me and I am bookmarking to try. Marmite caramel? I think I’m in love! I’m normally will only eat Marmite on toast with just the right amount of butter, but love the idea of the salty sweet caramel in these brownies. A must-try. I always love mixing sweet and savoury. I heard about Paul Young’s Marmite brownies and they had mixed reviews. I’m neither a lover nor a hater of Marmite so would be happy to try these. Most certainly after your review of them. Caramel sounds like a great touch! It would be interesting to lace the caramel with Marmite… the possibilities would be endless! 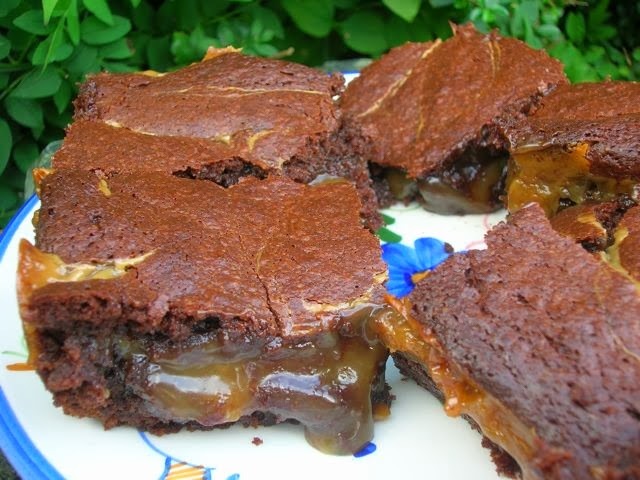 Marmite caramel in brownies….a heavenly combo! Just look at the oozing out center…o my..I wish I could have a bite now. I have never had the opportunity to try marmite, so I can’t quite imagine the flavor. Especially that of the chocolate bar… But I love the look of these, with the caramel oozing out… Very tasty looking, Choclette! Whilst I like marmite, I’m really not sure about these brownies. I will have to give them a go, because I just can’t imagine eating marmite and chocolate together! I think, however, I will refrain from telling anyone the special ingredient before they have tasted them as my family are a mixed bunch of marmite lovers and haters! 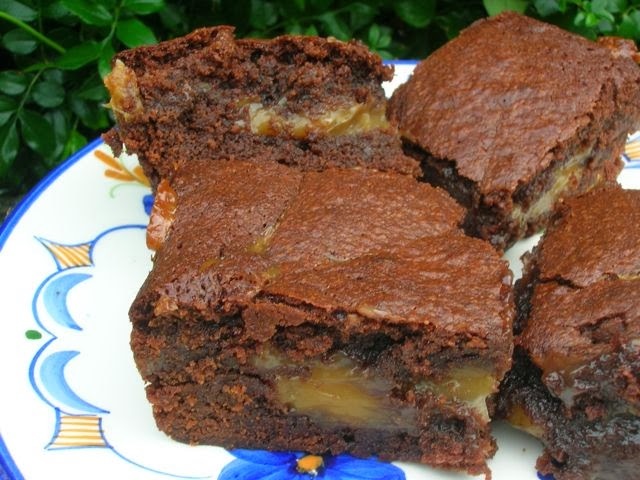 Good Morning to you, You are absolutely right, you either love Marmite or you hate it….. my husband loves Marmite and I love chocolate, so these brownies will go down a storm in my house. I love sweet and salty as I love peanut butter and jam, especially on an oat cracker….. mmm I wonder if Marmite and chocolate would work together. Thank you for such an interesting recipe, I will certainly be baking these. I have thoroughly enjoyed my visit and I have become a new follower, I am now going to enjoy your other recipes. Thanks very much for leaving such a nice comment and for following Daphne. Much as I love Marmite, I would never have thought I’d have enjoyed it with chocolate – just goes to show. Daphne, I tried leaving a comment on your Christmas Cake post, but it looks as though I can only do it if I’m on Google+ – which I’m not. I LOVE marmite and so do the kids so this cake is going to have to be tried one day. I’d give them a go, but I’d be very dubious about the Marmite. Sounds like an acquired taste! Would love to try it actually after reading this.